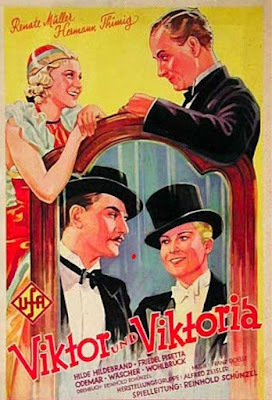 1982 saw the release of the gender-bending movie Victor/ Victoria. Produced by Blake Edward, the plot was about a struggling female soprano finding work playing a male who performed as a female impersonator. However, the 1982 movie wasn’t the first filming of Victor/ Victoria. For that we need to go back to Germany in the tumultuous year of 1933. Viktor und Viktoria was a German musical comedy released in December of 1933. It was written and directed by Reinhold Schünzel and produced by Alfred Zeisler. It starred Starring Renate Müller, Hermann Thimig, Hilde Hildebrand, and Anton Walbrook. 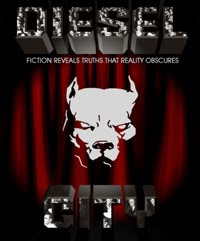 Like the Blake Edward’s movie, the plot also involved a woman pretending to be a female impersonator. At the same time that the German Viktor/ Viktoria was being filmed there was a French-language version being filmed titled George and Georgette starring Meg Lemonnier and a French cast. 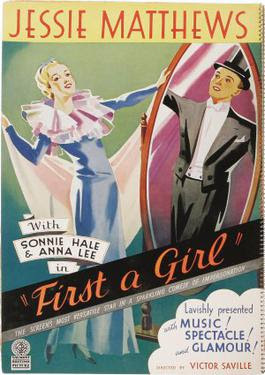 Later, in 1935 Michael Balcon produced an English language version titled First a Girl, which was directed by Victor Saville and starred Jessie Matthews and Sonnie Hale. Over the years Viktor/ Viktoria was remade several more times. Not only was there Edward’s 1982 version but there was also the 1957 version of Victor and Victoria in West Germany. Later, in 1975 a remake titled My Girlfriend, the Transvestite was filmed in Argentina. The most recent incarnation appeared in 1995 when Edward’s version of Victor/Victoria was made into a Broadway musical.